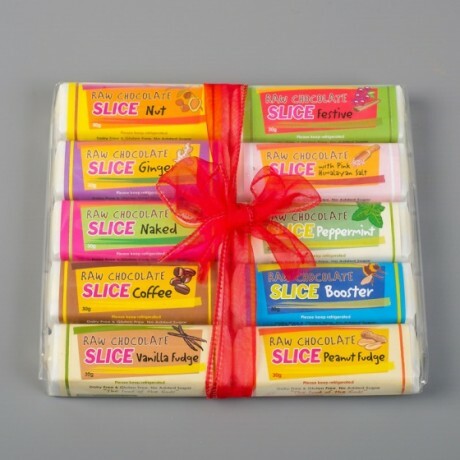 A delicious selection of raw chocolate or raw fudge slices, wrapped together as an attractive gift pack. They are raw to retain all the nutrients traditionally associated with cacao, are high in anti-oxidants and give a great energy boost. Suitable for vegetarians, diabetics, and those who are dairy intolerant. Shelf life: 5 months if kept in the fridge. Naked: Raw coconut oil, Raw agave nectar, Raw cacao nibs (18%), Carob flour, Ground almonds, Lucuma powder. Himalayan Salt: Raw coconut oil, Raw agave nectar, Raw cacao nibs (16%), Carob flour, Lucuma powder, Ground almonds, Pink Himalayan salt (1.2%). Nut: Raw coconut oil, Raw agave nectar, Raw cacao nibs, Carob flour, Nuts ( Brazil, walnuts, hazelnuts, almonds, pecans,cashew nuts ) (10%), Lucuma powder, Ground almonds. Coffee: Raw coconut oil, Raw agave nectar, Raw cacao powder (18%), Carob flour, Ground almonds, Lucuma powder, Coffee (2.5%). Booster: Raw coconut oil, Raw agave nectar, Raw cacao nibs(16%), carob flour, Lucuma powder, Ground almonds, Barley grass powder (gluten), Bee pollen, Macca and Goji berries. Peanut Butter: Organic Peanut butter (31.4%), Raw Coconut oil, Lucuma Powder, Ground Almonds, Raw Agave Nectar, Pink Himalayan Salt. Vanilla: Raw coconut oil, Lucuma powder, Ground almonds, Raw agave nectar, Vanilla essence(15%). Allergens are shown in bold. PLEASE NOTE: the Booster slice is NOT gluten free because it contains barley grass and NOT vegan because it contains bee pollen.